In the summertime, the first KinderMom and KinderDad event was held on Princess Peach’s third birthday. I was unsure of attending but then decided it would a fun morning birthday event that Princess Peach would be sure to enjoy! Afterall, she did get to eat a few Kinder Surprise Eggs first thing in the morning! I was told that Princess Peach would feel special at the event but I was blown away but HOW special they would make her feel! I just assumed a candle would be stuck into a kiddie scoop of ice cream and she we would sing her happy birthday. 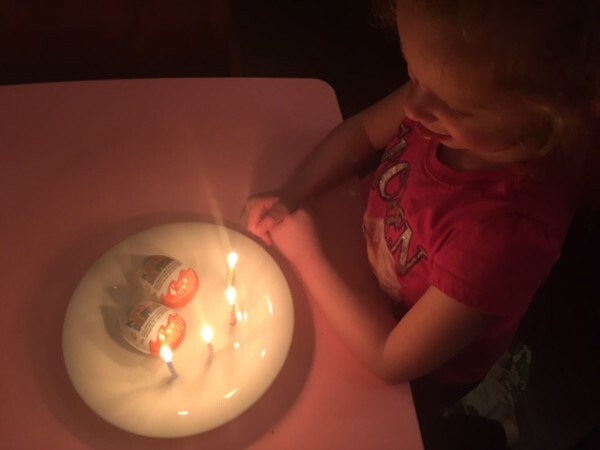 Instead they surprised her with the most amazing birthday cake I have ever seen, a GIANT Kinder Surprise Egg cake filled with Kinder Surprise Eggs! Not only was the cake beautiful to look at, but it tasted amazing too! It was beyond anything I had ever imagined. In our house, we celebrate birthdays and half-birthdays! Anything to feel special and celebrate, right? And anything for cake!!! Until I had kids, I would celebrate my birthday for almost a whole month! A few weeks ago it was Princess Peach’s half birthday which called for a celebration. I actually considered trying to replicate the cake above but figured it would end up in a disaster. Similar to those Pinterest fails, ya know? So I decided they it wasn’t in my best interest to even try. I thought about baking brownies or cookies but I’ve been so busy and time just got away from me. So I did the next best thing. I taped two Kinder Surprise Eggs to a plate and stuck some candles around it! I honestly felt like a genius. Win one for me Princess Peach loved it! Best of all we all shared the Kinder Surprise Eggs. On Instagram? I am and I’m obsessed!!! 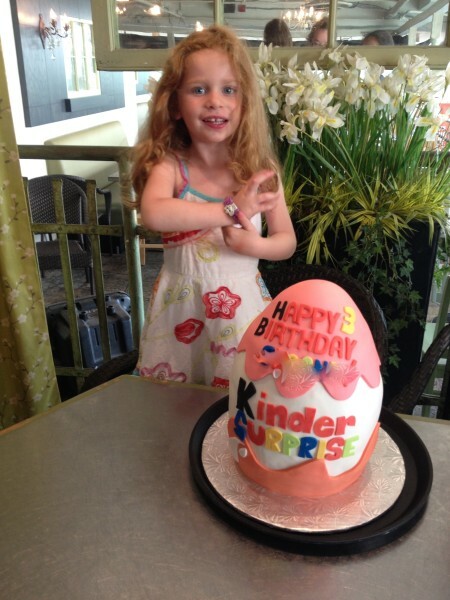 Kinder Canada is on Instagram too! 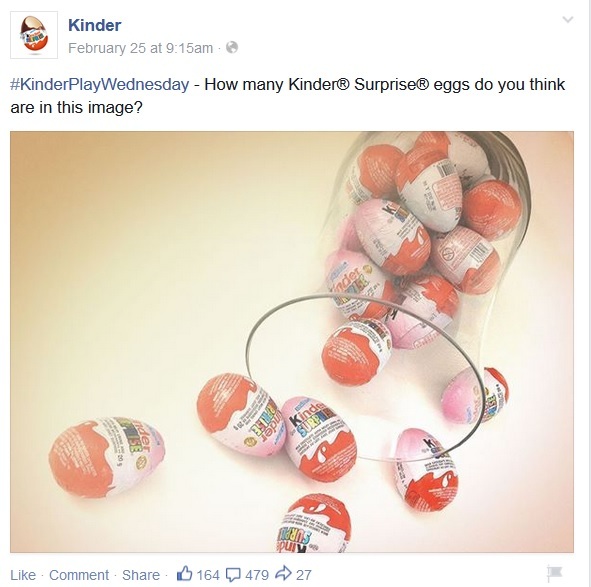 Post and tag your Kinder-themed pictures on Instagram for a chance to be regrammed by Kinder Canada!! Check out their thread to see all the Kinder-themed pictures too. I never thought about half birthdays. My kids are born in July and six months later is the Christmas/New Year non stop holiday season. I like the little kinder eggs as an acknowledgment. Very cute! Thanks for the info on Kinder. 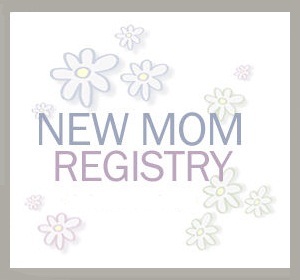 Stopping by from Mom Bloggers. Hah! Genious idea with the ‘cake’!! That is an amazing cake, I’m not sure any mom would be able to replicate. I like your idea and I’m sure she enjoyed it as well. 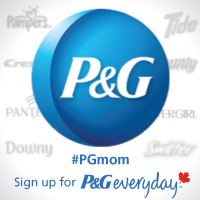 #Mombloggers. So adorable. I love the Easter egg cake. A half birthday is a great idea for my son because it would be in February. Actually it would be on Valentine’s Day so I could just combine the two. I had never heard of Kinder Surprise Eggs until now. Are they chocolate? 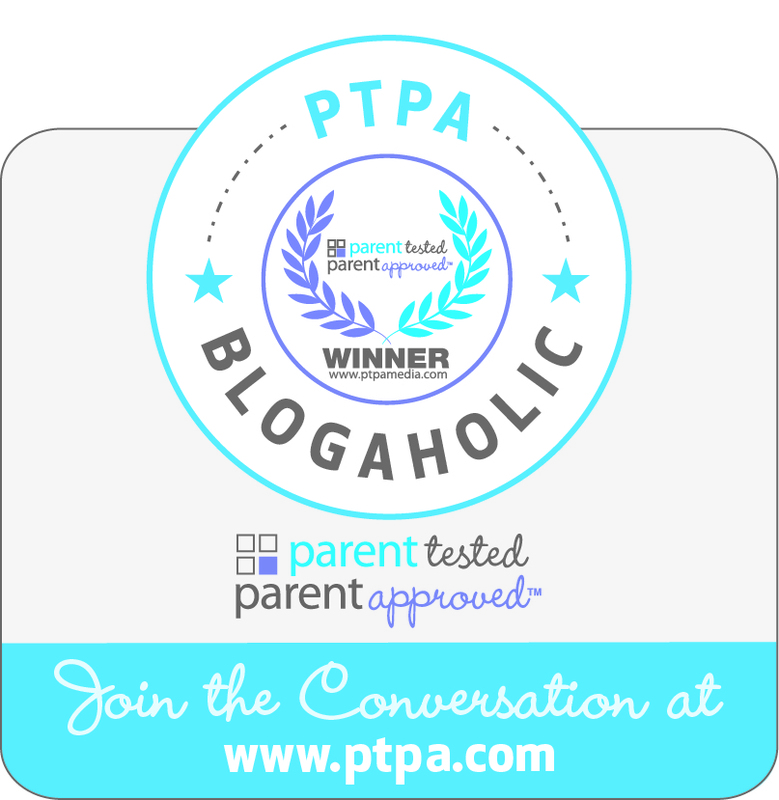 Stopping by from Mom bloggers club hop. Wanted to say hi! Hi Tricia. A very skilled baker made this cake so unfortunately I can’t help you out with any suggestions on how to make this cake!